TerraHaus Resident Assistant Ashley Sutton, student Katie Papoulias and resident Melissa Merritt talk Friday in the Unity College building's kitchen area. Students are moving in this week to the new, eco-friendly building. Unity College's brand-new 10-person residence hall, TerraHaus, is the first Passive House-certified student dormitory in the country. Solar panels on the roof, 10-inch thick insulation and special windows will help keep its energy costs down to $300 per year. UNITY, Maine — On a sticky late summer afternoon, Unity College junior Melissa Merritt began lugging boxes into her new home — a small residence hall called TerraHaus that was completed just days ago. The marine biology major from Wilmington, N.C., said she’s looking forward to living there with nine other college classmates, mostly to get off the school’s food plan and cook for herself in the kitchen. But school officials and others from the community are thrilled about TerraHaus for lots of other reasons. Toward that end, staff and students toured the residence this week and some students took a course last year about the project, which replaced two of the popular but inefficient 40-year-old halls called the Cottages. Each of those cottages housed four students and burned about 700 gallons of heating oil each year. “They’re energy hogs,” Pyles said. Not the new building. Belfast-based GO Logic designed TerraHaus with green building components including solar orientation, superinsulation and special German-designed windows which capture the sun’s energy much better than the windows most people have in their houses. 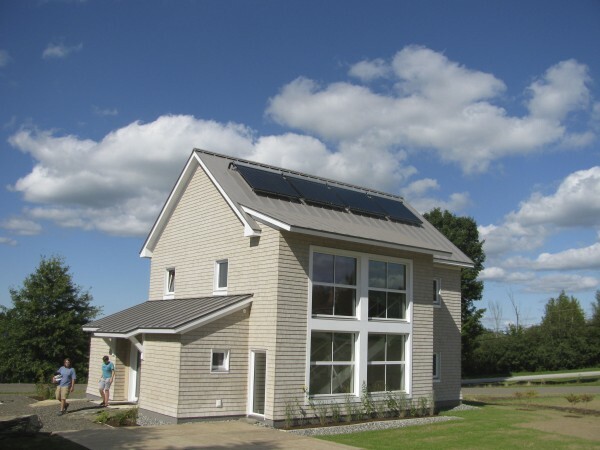 It also uses a heat pump that can provide both heating in the winter and cooling in the summer. Building to this standard while adhering to institutional guidelines and the Americans With Disabilities Act isn’t exactly cheap. The 2,000-square-foot building, on which work started in May, cost $470,000, Pyles said. That works out to $235 per square foot, which is more than twice the average cost of building a new home in Maine in 2010, according to the website www.home-cost.com. But compared with other college residence hall projects from around the country, Pyles and others believe that the TerraHaus is among the most economical. “Preliminary data indicates that this type of construction is very cost-effective for college campuses — much lower cost per square foot and per student than reported for other new residence hall construction in the Northeast,” Doug Fox, director of the college’s Center for Sustainability and Global Change, wrote in a recent blog post about TerraHaus. Unity College received a $389,000 grant from Delaware-based Kendeda Fund and $25,000 from Bangor Savings Bank to construct it. Officials hope that eventually the college will be able to tear down the remaining Cottages and replace them with SonnenHaus Village: three structures with the same features as TerraHaus. “[It’s] a way to walk the talk,” Fox told the BDN earlier this summer. 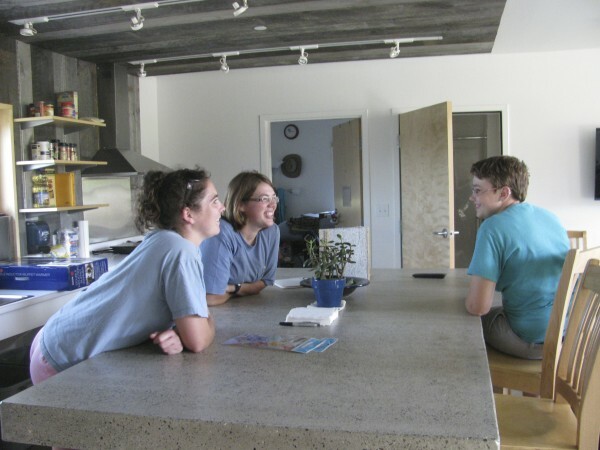 Ultimately, for students such as Merritt, TerraHaus is important mostly because it’s her home, not because of its efficiency or groundbreaking sustainability features. But still, there’s something special about being the first in the country, she said. “I think it’s pretty cool,” she said.